Diver on wreck of the U-352, North Carolina, USA. Photo by Larry Cohen. Because of the sea conditions and the German “artificial reef program” of World War I and II, this area is nicknamed the “Graveyard of the Atlantic.” More than 1,000 vessels have been confirmed in the shipwreck inventory conducted at the Outer Banks History Center on Roanoke Island. There are many more wrecks that have not been discovered or identified yet. Many of these wrecks are in diveable waters. Since early colonial times, the North Carolina coast has been a shipping lane between northern US ports and the southern United States. Ships traveling to and from the United States to Europe, South America and Central America pass through these waters. Before better weather forecasting, radar, sonar, LORAN, GPS and other technical breakthroughs, ships sinking due to collisions and environmental conditions was common. War caused many ships to vanish. More than 60 vessels were lost during the Civil War. At least 15 disappeared under the waves in World War I, and approximately 90 more were lost in less than a three-year period during World War II. All of these wrecks are now time capsules. Time stopped when they slipped below the waves. Now divers can explore these sunken museums. Besides the historic ships, the North Carolina Division of Marine Fisheries scuttled 42 artificial reefs. The ships were sunk on purpose to attract marine life, and some of them have an interesting history. All of these structures are home to some astonishing marine life. Cold water, which flows down the coast from the north, collides with the warm Gulf Stream current, coursing up from the Caribbean. Both currents bring in their share of inhabitants. The longer the boat ride, the closer the diving will be in the Gulf Stream. Marine life normally found up north, including blackfish, American goosefish and bergall, can be found on North Carolina shipwrecks. Tropical fish, including a variety of angelfish, southern stingrays, Atlantic spadefish, greater amberjacks, hogfish and barracuda, are very common—so are gigantic spiny lobsters and other crustaceans. Even the occasional giant manta ray has been spotted soaring over a North Carolina wreck. Many different species of sharks, including lemon, bull, tiger, white dusky, sandbar, spinner and thresher sharks, can be found in North Carolina waters. The most common one, and the star of the show, is the sand tiger shark. Sand tigers can be found gathered on the shipwrecks. Scientists believe they are here during the summer months to mate. Sand tigers can grow as large as 3.65m (12ft). Their pointed snouts and jagged teeth, give them a terrifying look, but they are very gentle and swim slowly. Photographing these large, scary-looking sharks with a shipwreck in the background makes the prefect Kodak moment. The artificial reef Aeolus has a history. She started life as an attack cargo ship and later became a cable repair ship. Now, she sits in 27.43 to 33.5m (90 to 110ft) of water. The ship was split into two during a powerful hurricane, and the stern is sitting upright but is intact. The stern has a ceiling but no longer the sides; the decks are mostly open. There are usually four to a dozen sand tiger sharks in this area of the wreck. Many divers call this area “Club Aeolus,” or the shark ballroom. The Caribsea is a wreck with history that is also a great place to observe sand tiger sharks. The Caribsea was a cargo freighter. On 11 March 1942, the ship was on a voyage from Santiago, Cuba, to Norfolk, Virginia. It was carrying a cargo of manganese. At 2:00 a.m., two torpedoes struck her on the starboard side. The torpedoes were fired by the German submarine U-158. Only seven of the 28-crew members survived. They spent ten hours in the water. The freighter SS Norlindo rescued the survivors. Now, the ship sits in 21.34 to 27.43m (70 to 90ft) of water. The boilers, engine and bow are the highest point of the wreck and divers will find those areas the most interesting. Visibility on this wreck could be low. Besides sand tiger sharks, it is not unusual to see Atlantic spadefish, flounder, grouper and greater amberjacks. There are still new discoveries to be made on dive sites that have been visited for years. The wreck which was known to be the Papoose is now believed to be the W.E. Hutton. This wreck is 36 nautical miles from shore and sits right in the Gulf Stream; visibility of 30m (100ft) is not unheard of here. The wreck is upside down in 36.5m (120ft) of water. It is 132.5m (435ft) long. Between the structure, visibility and marine life, this is a spectacular dive, both inside and outside the wreck. The highest part of the wreck is at the stern. The rudder area rises about 9.14m (30ft) from the bottom. In 2014, the rudder blade broke away from the stern and fell into the sand, but the rudder is still a remarkable subject for photos. The USS Schurz had a split personality. In 1894, the ship was constructed in Wilhelmshaven, Germany. She started life as the German gunship SMS Geier. At the outbreak of World War I in 1914, the Geier was docked in Honolulu, Hawaii undergoing repairs. This was before the USA entered the war. She was held by the United States where she remained in dock for over two years. When the United States entered World War I in 1917, the US Navy took over the ship and renamed her the USS Schurz. Now the ship served as a United States gunboat fighting against the country where she was built. On the night of 18 June 1918, approximately 28 nautical miles from the North Carolina coast, the merchant ship SS Florida was running without lights to avoid being torpedoed by German U-boats when she plowed into the USS Schurz. The SS Florida was seriously damaged but did not sink. The Schurz sunk in 33.5m (110ft) of water, three hours after the accident. On the bridge, one sailor was killed and the commander was injured. Nearly 210 sailors survived. Nowadays, the upper sections of the hull have collapsed, spilling the innards of the ship out onto the sand on the port side. A large pile of heavy gauge chain in the middle of where the foredeck once stood marks the location of the anchor chain locker. Off to the port side, a pair of large 5-inch guns lie atop one another. The four boilers and engine are the highest parts of the wreck. Some days, the baitfish is so dense that you cannot see the wreck through the school of fish. The story of the German U-boat, U-352, is legendary. German U-boats were sinking so many merchant ships off the US coast that the German navy called this “The happy Times.” The U-352 was not so lucky. She never made one kill. The U-352 was a type VIIC U-boat that was built in Flensburg, Germany, in 1941. The U-352 left for the United States at the beginning of April 1942. It cruised at a slow speed, and crewmen reported that they had been able to sunbathe on deck. Once, the sub was spotted and had two bombs dropped on her, but she escaped without damage. The U-boat cruised the North Carolina coast looking for merchant ships to sink. Around 4:00 p.m. on 9 May 1942, the crew spotted what they thought was a merchant vessel. Commander Hellmut Rathke eagerly ordered a torpedo to be fired at the ship. Unfortunately, the torpedo missed. It turned out that this was not an unarmed merchant ship but the Coast Guard cutter Icarus. Realizing his mistake, Commander Rathke brought the U-352 to the sea bottom at 29m (95ft). This was not deep enough to avoid the barrage of depth charges deployed by the Icarus. Knowing that the damage was too extensive to escape, Rathke gave the order to abandon the sub. When it returned to the surface, the Icarus immediately opened fire with 50-caliber and 30-caliber machine guns. The Coast Guard ship then fired a 76mm (3-inch) gun on what was left of the conning tower. This forced men who were clinging to the conning tower to jump into the water. At around 5:14 p.m., the U-352 slipped under the sea in 33.5m (110ft) of water. The Icarus changed locations for approximately an hour while waiting for instructions on how to proceed. They then returned to the site and rescued 33 survivors, one of whom past away while on board. The survivors of U-352 were later questioned and were held in several prisoner-of-war camps until the end of the war. During questioning, the German sailors did not admit to seeing the US coast, but they were able to listen to American radio programs. Reportedly, they enjoyed listening to jazz. Olympus Dive Center founder, George Purifoy, and several friends discovered the U-352 in 1974. 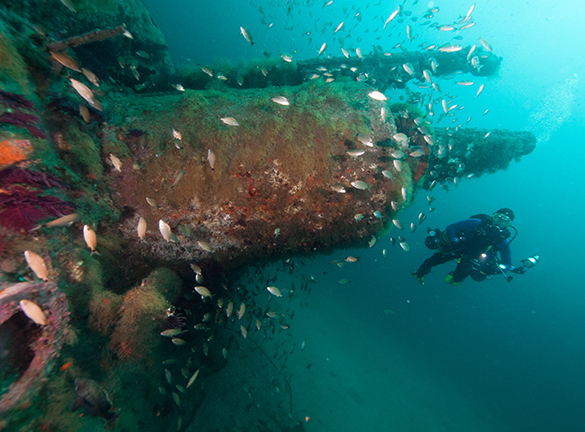 Diving the 66.5m (218ft)-long wreck feels like taking a time machine back in time. While diving the U-352, which sits upright with a 45-degree list to starboard, it is impossible not to think about the drama that took place that fateful day on 9 May 1942. The outer hull has deteriorated, but the sub is otherwise intact. The top of the conning tower is the highest point and sits at 27.5m (90ft). During a dive, you can see the forward torpedo tubes where the bow has cracked, a gun mount and the conning tower. Even though the interior can be accessed through the galley hatch, the U-352 is a war grave and penetration is illegal. The wreck attracts schools of baitfish sometimes so thick you cannot see the wreck. Amberjacks as well as a variety of smaller fish, sponges and some corals can be seen. The story of the U-352 does not stop with its sinking. In September 1985, Olympus Dive Center hosted a reunion of the survivors. During that reunion, the “Funkmeister” (radio operator) Kurt Kruger came to Purifoy with a request. Kruger described in great detail the location of his personal locker on board and told Purifoy that there was a coat, camera and pistol in his locker. He requested Purifoy to bring up the contents of his locker on a future dive. Purifoy agreed and brought up the contents of the locker. Most clothing in the locker were destroyed by seawater, but the coat remained intact. Kruger identified it as his because of the radio operator patch sewn on the coat. Purifoy also salvaged the camera and pistol. It is likely those items also belonged to the radio operator but they could not be positively identified. Kruger asked Purifoy to keep on permanent display his personal items at the Olympus Dive Center. Now everyone visiting can admire these treasured artifacts. These are just a few of the wrecks that can be explored when visiting the Morehead City area of North Carolina. Due to weather, being blown out is a real possibility. Fortunately, there are many other activities to do besides diving. The North Carolina Aquarium at Pine Knoll Shores is worth visiting on a rainy day when the boats stay in port. There is even a large tank with local marine life and a realistic model of the U-352 wreck. Other highlights include a touch pool and a large shark jaw. The hurricane simulator is fun for children and immature adults! Other indoor activities for a rainy day include the North Carolina Maritime Museum where, you can learn about Blackbeard the Pirate. Artifacts of his ship, Queen Anne’s Revenge, are on display. Exhibits about the early US Lifesaving Stations, which is the predecessor of the US Coast Guard, is extremely interesting. Visiting downtown Beaufort is like taking a stepping back in time. Visitors can explore nine historic buildings, accompanied by tour guides in period costumes. Highlights include the 1796 Carteret County Courthouse (the oldest wooden courthouse in North Carolina), the 1829 “Old Jail,” an 1850 doctor’s office and apothecary shop (with adjoining herb garden), and the 1732 Russell House, which is the site of the oldest art gallery in North Carolina. Oftentimes, the sun is shining, but the wind is blowing so strong that diving is out of the question. On those days, there are plenty of outdoor places to explore. Taking a hike in the Theodore Roosevelt State Natural Area is a delight. This area is behind the North Carolina Aquarium at Pine Knoll Shores and includes a maritime forest with shrubs and salt marsh. Here, birds, including white ibis and painted bunting, can be observed. Even when the wind is too strong for dive boats to get offshore, the ferries from Beaufort still run to the uninhabited island of Shackleford Banks State Park. Here, you can comb the beaches and search for wild horses. These horses’ ancestors are said to date back to the 16th century when European ships wrecked on the beaches. The horses then became stranded. Although wild, they are rather tame and make great photo subjects with the ocean in the background. Another way to get wet is to take a paddleboard lesson with Carolina Kitesurfing in Emerald Isle. Even when the ocean is wild, the backwaters can be calm—the prefect place for a relaxing paddle. Fort Macon State Park is a picturesque historic landmark on the ocean. Construction began in 1826. In the 1840s, Robert E. Lee initially engineered a system of erosion control. He later became the general of the Confederate Army. At the beginning of the Civil War, North Carolina seized the fort from Union forces. The fort was later attacked in 1862, and it fell back into Union hands. For the duration of the Civil War, the fort was a coaling station for US Navy ships. Nowadays, the fort is home to the Coastal Education Center. There is a large exhibit hall featuring numerous exhibits about the natural history of the park, barrier island ecology and the interaction of natural and cultural history associated with the Fort. Museum rooms located in the fort casemates have displays about the fort’s history. Restored quarters give visitors a look into the lives of the soldiers. The beach in front of the fort is a great place to go swimming (there is no swimming on the inlet side due to strong, dangerous currents) or to fish. According to the North Carolina Division of Parks and Recreation, the fort is now home to the Coastal Education Center. In the large exhibit hall there are many exhibits about the natural history of the park, barrier island ecology and the interaction of natural and cultural history associated with the Fort. Museum rooms located in the fort casemates have displays about the fort’s history. Restored quarters give visitors a look into the lives of the soldiers. The beach in front of the fort is a great place to go swimming (there is no swimming on the inlet side due to strong dangerous current) or to fish. After a busy day of diving or exploring the area’s many attractions, a sunset stroll on the Bogue Inlet Fishing Pier is a great way to end the day. The people are friendly, and it is fun to see the ocean and watch the locals fish. Thanks go to Atlantis Charters and Olympus Dive Center. Larry Cohen and Olga Torrey are well-traveled and published underwater photographers based in New York City, USA. They offer underwater photography courses and presentations to dive shops, clubs and events. For more information, visit: Liquidimagesuw.com (Larry) and Fitimage.nyc (Olga).